This easy sweet and sour chicken is delicious over hot cooked rice. Mushrooms, bell pepper, and pineapple chunks give this chicken extra flavor and crunch. The chicken is a snap to bake with vegetables and a jar of sweet and sour sauce. 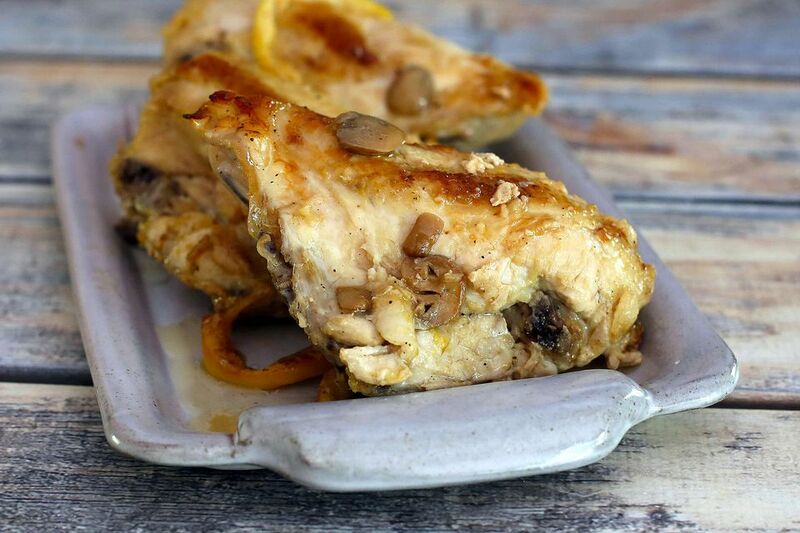 Use a cut-up chicken, split chicken breasts, whole legs, or thighs in this recipe. Place the chicken pieces in a 9-by-13-inch baking pan or a roasting pan, or a large shallow baking dish. Sprinkle the chicken generously with soy sauce. Add water to baking dish to a depth of about 1/4 inch. Top the chicken pieces with the chopped onions, mushrooms, pineapple, and bell pepper. Combine the reserved pineapple juice with the sweet and sour sauce and stir until well blended; pour over the chicken. Bake for 50 to 60 minutes, or until chicken is tender and juices run clear. Use a food thermometer to ensure the chicken cooks to at least 165 degrees (the minimum safe temperature, according to foodsafety.gov). Chicken breasts become dry if overcooked, so they might have to be removed before other pieces are done. A mixture of red, green, and other colored peppers makes a more colorful and attractive dish.